Through the years, Elvis fans have asked for a soundboard recording to be released officially. Sure we have had many decent bootlegs containing such material, but never from BMG since 1980 (Elvis Aron Presley). Now 20 years later, BMG finally decides to release a concert recording from the mixing console. One can only thank and congratulate BMG for this decision! Eventually, I guess there were no other way around this matter. If BMG should be able to maintain the rather high frequency of new releases, the large amount of soundboard recordings had to be used, on way or the other. What about BMG then...can they "compete" with the bootleggers on quality and sound mixing? Judging from this release, they can. However, it is not a masterpiece production. Look at the front cover, and you will immediately understand that! It is actually also a bit strange that BMG decided to release a recording from 1976 as the debut. The year 1976 does not offer Elvis in his prime, rather the opposite! However, most soundboards from 1976 have great sound quality. And this is important, after all! There is one performance that makes up for all the waiting, all the flaws at the rest of the concert, and lousy cover work - 'DANNY BOY'! Listen to this song, and your previous disappointments are washed away. It is the ultimate surprise, and a breathtaking delivery! The concert begins right in the middle of the opening riff. Elvis throws himself into a mediocre version of 'See See Rider'. This one is lifted from a soundboard recording two days before Tucson, namely Odessa, May 30 1976. I suppose 'See See Rider' from the Tucson concert was not recorded. I cannot understand why BMG decided not to include also the opening number, 'Also Sprach Zarathustra'. I find this number so essential, that without it I never really get the right "concert mood". OK, the total running time is over 74 minutes already, so there might not be place for it... It is all a matter of giving priority. I certainly prefer 'Also Sprach Zarathustra' to the drum solo by Ronnie Tutt, or other band solos! The sound on the numbers from Odessa is very different from the sound on the Tucson concert. VERY different! Strange that BMG did not find a soundboard tape with a similar sound to the Tucson tape... When the CD goes from 'See See Rider', then right over to 'I Got A Woman' it is unnatural. The fact that BMG decided not to include Elvis' "well, well, well" monologue before this last song, makes it even more artificial! Sloppy work there, BMG! The Tucson concert reminds very much about the one Elvis held in Memphis one month later. Not only Elvis performance, but also the sound picture. A bit hallow, narrow and flat, though still very clear! Overall, the sound quality on this disc is very good, but not as fresh as on e.g. Luxor's and DAE's releases. I doubt that BMG spent much time on the mixing of this release, but the source seems good. The mentioned 'I Got A Woman/Amen' holds no surprises. Neither does 'Love Me' nor 'If You Love Me' (or "If you love me let me go" as Elvis names the song). 'You Gave Me A Mountain' is a typical "1976 version". Unfortunately BMG has not managed to remove the terrible voice of Bill Baize at the end of the song. Jeez...he is way out, this guy! If I said that the medley sequence was the best part of the concert, would you believe me? Probably not! Well, it isn't either...:-) Standard delivery this day also, but Elvis also sings some seconds of 'Blue Moon Of Kentucky'! 'And I Love You So' is performed a bit slower than usual, otherwise nothing to report. 'Jailhouse Rock'...Yeah right! Nice that Elvis sung 'Help Me' this evening. Unfortunately, the tempo is excessively slow. It sounds a bit off-key when performed at this tempo. A disappointment! 'Fever' is as usual. Elvis rarely did a bad performance of this song. Today's version holds no surprises in any direction. Finally, the tempo is raised a bit: 'Polk Salad Annie' is a great song in any version. This particular version is a refreshing contribution to the show. After this Elvis goes into the introduction of the band... or does he? There is an edit right after 'Polk Salad Annie', and I wonder if BMG has removed a song or two...Perhaps America is edited out? I don't know, but at least the CD is tampered with after 'Polk Salad Annie'. Sorry to say BMG has decided not to sequence the introduction of the band to several CD-tracks. This means that track number 13 runs for 13 1/2 minutes, and contains 'Early Morning Rain', What'd I Say, 'Love Letters' and 'School Days'. I wonder why they have done it this way. After all it is nice to be able to select the song you want to hear without much "work". Anyway, the actual band introduction is coherent and partly fun. Not too drawn out, like it could be some times. 'Love Letters' is not from Tucson, rather from Odessa (like 'See See Rider'). BMG probably found this to be a better version than the Tucson version. If so, it certainly says a few things about the Tucson version of the song... The version on this CD is bloody awful! It is so slow and painful that you wish you could speed it up while playing it. The sound quality on this Odessa number is not as good as on 'See See Rider' (recorded some hours earlier on the afternoon concert), however still good! Elvis sings two versions of 'Hurt' this day. Both very typical for summer 1976! I'm not quite sure I follow Tony Brown's piano playing, though. However, Elvis does two good deliveries of this "stunt". 'Burning Love' is a nice addition to an otherwise predictable set list. However, it is predictable that Elvis forgets the lyrics to the song! A nice addition is indeed also 'Help Me Make It Through The Night'. This is a good performance. Unfortunately, it is only one verse long when Elvis decides to conclude it. A pity! Then - the core essence of this concert - and probably the ONLY reason for releasing this otherwise mediocre concert...'Danny Boy'. The reason that Elvis sings this song, is because of a request he gets from the audience for 'The Last Farewell' or any other song from his new album (Elvis Presley Boulevard). Elvis starts singing 'Danny Boy' almost by instinct, though he is not fully aware that this song was on the same album as 'The Last Farewell'. It ends out in a breathtaking performance. One word...ELVIS! This song alone is worth the whole release, no doubt about it! After this, Elvis throws away 'Hound Dog'. Then it is time for lights on, and a look at the audience before ending the show with 'Funny How Time Slips Away' and 'Can't Help Falling In Love'. This release is in many ways a milestone. Not that the concert is great (rather the opposite), but the fact that BMG finally decided to release a soundboard recording. Hopefully, and most likely more will follow. A bit strange that BMG chose to release a concert from 1976, but as said, I guess it all depends on one song; 'Danny Boy'. BMG's editing of 'See See Rider' and 'Love Letters' does not impress me, though! It would have made more sense to use versions from other soundboards where the sound picture was more or less the same as on the main concert. Especially the sound mix on 'See See Rider' is way off the rest of the concert. On the other hand, I would like a complete release of the Odessa show too. I rather like the up-front keyboard sound! Well, I guess we can wait in anticipation for the next soundboard release from BMG. Support this one, and it will definitely come! This makes it Vol. 6 in the ongoing collector's label Follow That Dream; started by BMG to cater to fans of the King. The year is 1976 at the Center Arena in Tucson, Arizona. In the midst of another blistering, lightning tour of America's heartlands, Elvis is pulling in reserves he never knew he had to stand up and deliver for the faithful. He's spitting them up, made to order, served with little pride and on a conveyer-belt like processed food. So why would anyone want warmed over leftovers for a meal? As he stumbles over lyrics, is left breathless on demanding songs that tax his vocal chords, makes sick jokes and sometimes laughs out loud at himself, and us, you must wonder why the fans are still there watching the concerts...buying the records. The songs here that have an ounce of integrity in the performance are the ones that still move Elvis. The love songs, the lustful songs, the rock 'n' roll songs are dished up sometimes less than "adequately", a term Elvis uses to describe his singing. 'Love Letters' is the low point. The first high point of the evening comes on the devotional 'You Gave Me A Mountain', sung with the feeling of a penitent on his knees acknowledging how wasteful he had been with his gifts. The next is a batch of songs from his later albums starting with Timi Yuro's 'Hurt' to 'Burning Love', 'Help Me Make It Through The Night' and 'Danny Boy'. Each - on hindsight - a plea for forgiveness and strength. Less than five songs, isn't any kind of reason to buy this �16 CD. There must be something more. I think it's because my relationship to Elvis is like a marriage. Like the vows of sticking together through thick and thin, in good times and bad, in sickness and in health. Elvis isn't any rock star. He was the man who mapped the way for all the others to follow. At first, like most fans, I only kept the really good albums. Later I realized it mattered to me to listen to Elvis, even the bad performances and the dumb love songs. He had become like a friend and I wanted to know more. As many of you know, this was the first soundboard recording published by RCA on its FTD collection and it includes the almost entire show from Tucson, June 1 1976. As regards the show, I can say that it is a quite good show, with some highlights and some low points. The recording starts with 'See See Rider', this taken from the Odessa show two days earlier. In this version, David Briggs' electric piano is very audible and it is quite horrible to listen to. Then, as usual, we have 'I Got A Woman', which starts without the "Wull Wull intro" and it is taken from the Tucson show. Everybody can hear the sound differences between this track and the previous one, so it is quite difficult to understand why RCA decided to make this kind of job. 'I Got A Woman' is similar to many other versions heard in 1976. Then it's time for 'Love Me' and the usual ritual of the scarves. 'Love Me' is followed, as in nearly all 1976 concerts, by Olivia Newton John's hit 'If You Love Me' (Elvis introduces it as "If you love me let me go"). This is one of the poorest versions I have ever heard him giving. If you have on mind the "ELVIS IN CONCERT" (June 21 1977) version, well, there's an abyss between them. 'You Gave Me A Mountain' has a false start, due to Elvis' willing to have fun with some girls in the first rows. His final version is real committed and sounds greater than ever. The show goes on with a classic sequel of songs from the 50', 'All Shook Up' and the usual medley 'Teddy Bear/Don't Be Cruel'. Sometimes I ask myself why Elvis didn't sing some masterpieces in his shows ('Always On My Mind, 'If I Can Dream' and so on) instead of singing these songs. He was really through of. 'And I Love You So' is well sung if compared to other live versions from this year, while the following 'Jailhouse Rock' is played by the TCB band in a slower tempo than the 1977 versions. His rendition is what Elvis was able to do in 1976, good even if he could do better. Then Elvis decides to sing a song that turned out to be the last gospel piece he had ever recorded, 'Help Me'. This version is much slower than the March 1974 versions, when Elvis first introduced the song on his live repertoire. But it is sung with passion and strength, despite Sherrill Nielsen's backup. Introduced by Elvis as his new piano-player. Tony cannot be compared to Glen Hardin, but he is a great musician and he shows it. After David Briggs' introduction, it's time for 'Love Letters'. This one is taken from the evening show in Odessa, May 30 (I still wonder why!) and Elvis sounds insecure. The best version of 'Love Letters' I have ever heard is taken from "Old Times Are Not Forgotten", much more committed than this one in Odessa. After the usual 'School Days', its time for Elvis to sing his latest record at the time, 'Hurt'. In my opinion, 'Hurt' is a test song for Elvis. If he sings this well, that means he is in good shape. Elvis decides to sing this song twice and the second version is better than the first one. 'Burning Love' is surprising, because Elvis is really strong on it and this version (with a very long "HUNKA HUNKA" finale,) is really enjoyable. It is clear that this part of the concert is better, also because of the fantastic and unfortunately too short following version of 'Help Me Make It Through The Night'. Then someone in the audience takes a request, a song from his latest album called 'The Last Farewell'. Elvis politely answers while laughing, "I wish I knew it! ", and then starts the real highlight of the evening, 'Danny Boy'. Sherrill Nielsen usually sang 'Danny Boy', and this is a real rare performance by Elvis. His version is even better than the other ones heard on "Platinum" and in the "From Elvis Presley Boulevard" Album. I agree with those who think that only for this song the entire CD deserves buying. The show goes towards the end with another piece from the 50's sung as often not too seriously, 'Hound Dog'. As a ritual, Elvis ask to turn the house lights up in order to see his audience before starting 'Funny How Time Slips Away'. Here it seems Elvis as in those great 1972 nights, vigorous and in control. Before launching himself into the usual ending 'Can't Help Falling In Love', a happy and loyal Elvis thanks his Tucson audience, promising them that he would comeback whenever they would like him to. The recording ends with a few seconds of the closing vamp. In conclusion, I think this CD doesn't contain one of the greatest Elvis Presley's shows, but it is worth buying because of some great performances and a rarity, 'Danny Boy', maybe sung only in this concert by the greatest singer of all times. As a fan of Elvis Presley, knowing that there was a good amount of live material available in BMG's vaults, I had been hoping that they would finally release some shows. In 1996 AN AFTERNOON AT THE GARDEN was the first new release in some time and yes, it was nice to have a new unavailable show. However, it was basically identical to the original 1972 release, AS RECORDED AT MADISON SQUARE GARDEN. The Madison Square Garden shows were one of the many milestones of Elvis' career, but the actual performances were by then just part of his live routine (which at that time still could have a lot of energy and excitement). It seemed that at the time (1996), there was potential for BMG to release more shows, but nothing happened. Finally, in 2000, BMG released an entire show from Elvis' incredible third season run Vegas from 1970 on THAT'S THE WAY IT IS - Special Edition. Around the same time, it was announced that BMG's FTD label was going to release a soundboard recording of a live show from 1976. The show was from Tucson and subsequently released as TUCSON '76. Let me say that this was great news. BMG was releasing another concert recording only a few months apart from its last release. 1976 was definitely not one of Elvis' best years on stage. He had been in decline physically and emotionally for some time and his live performances suffered drastically from this. However, Elvis' shows from the last couple of years of his life can be quite fascinating. After listening to TUCSON '76, the only conclusion that I can come to is that it is a horrendous and embarrassing show. First of all, BMG doesn't do the show any further justice by tampering with it. Adding 'See See Rider' from another show in completely different sound quality doesn't help things. Now it is understandable why BMG did this as they wanted to give the listener a "complete" show and since the Tucson soundboard recording doesn't kick in until the second number they felt they had no other choice than to do so. If they felt the need to give the listener a "complete" show, they should never have left out 'Also Sprach Zarathustra.' Also, why throw in 'Love Letters' from another show? 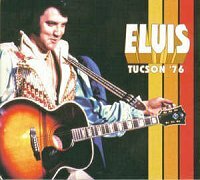 If Elvis performed it in Tucson, it couldn't have been much worse than the version BMG inserted from Odessa. BMG should never tamper with the history of a concert by adding or omitting material. If they are going to release complete shows, they should leave them as is, otherwise it defeats the purpose. Let the listeners and fans decide whether or not they like the material (it is hard to trust Ernst Jorgensen's song selections at this point in time). The artwork is degrading. It appears BMG used some of the most unflattering pictures of Elvis available. At the same time, the photos are a clear representation of the music. It would also be nice for BMG to credit the musicians who performed and to also include some biographical information about the show, the tour, and state of mind which Elvis was in during that time. Considering the performance is so terrible, some tasty artwork and information could make up for it a bit. With FTD though, the fans shouldn't get their hopes up. It is very clear that Elvis was completely loaded during this show. I have heard from people that he was in good spirits on this particular day. He may have been in a good mood, but that certainly didn't make this a quality show. With all the drugs coursing through his system that day, I would hope he was in a good mood. While listening to the show, I wanted to hear the brilliance that I knew Elvis was capable of (even in 1976-1977, Elvis was still able to manage some beautiful moments vocally on stage). I didn't hear any of it for the most part. Elvis' vocal performance is flat and dull. His voice is basically walking through the songs. He had trouble speaking coherently at times. There is basically 0% interest and effort from Elvis during this show. Can you blame him? His concerts had become a boring and predictable affair by then. An occasional surprise in the set-list or the rearranging of the band intro segment, were basically the only aspects of his show that he had modified in 6 years. The structure of the show never changed (and of course there are many reasons and theories behind this, which is a separate discussion altogether). There is nothing impressive about the set-list other than the inclusion of 'Danny Boy'. This is obviously the only reason why this particular show was chosen as an FTD release from 1976. The fact that he performed this song on this day, which apparently he never did before or again on stage, makes this release valuable for fans. And the bottom line is, Elvis pulls it off. This is the only song that I hear a committed Elvis on. It is wonderful at moments and very sad at others. He puts a big effort into succeeding even though his deteriorating physical condition can be heard through the microphone at the same time. It was nice to hear him concentrating on at least one song. The other performances during this concert are a joke. 'All Shook Up', 'Don't Be Cruel/Teddy Bear', 'Jailhouse Rock', 'Love Me' and 'Hound Dog' are all hard to listen to. How could anyone in the audience have enjoyed those performances? In fact, this reviewer found everything other than 'Danny Boy' difficult to get through. There is also little passion when he performs some of the ballads such as 'You Gave Me A Mountain' and 'And I Love You So'. The musicians must have been embarrassed while performing, and even Elvis would have been, if his mind weren�t so polluted with chemicals. The band got paid and more importantly, so did Elvis and the Colonel. This was the obvious motivation behind this show. Yet with all my criticisms, there is an important aspect to this show. It almost single-handedly shows the aura and legend of Elvis Presley. As tragic as he and his concerts had become, he was still able to sell out arenas. It doesn't necessarily matter who was attending the shows at that point, he was selling a lot of tickets and still was a major concert attraction. Very few artists could get away with the lackluster quality of his shows and studio recordings for as many years as he did and still be a popular act. When I listen to a show such as this, it makes me cringe because Elvis could have been so much more. If only he would have had some creative direction and guidance from his manager and record label, or had the ability and the ambition to make changes in his life, his legacy and career could have flourished to further heights. We must congratulate BMG for making this audio document available. Hopefully they will continue to release live concert recordings, because good or bad, they are exciting and fascinating to hear. The first soundboard that we have for a long, long time from the official label is a good show with some surprises. The show was recorded in Tucson, Arizona in June 1st 1976. The artwork is weak, but I have seen worse on the FTD-series. I like the design of the disc itself. The sound is very clear and loud, with all the instruments very audible, but somehow it does not give you that "live feeling" like on Let Me Take Your Home or Holding Back The Years, for example. But let's talk about the very good content. The CD starts off with a very, very unusual version of 'See See Rider' lifted from Odessa, with David Briggs "Funk axe" well in evidence. Elvis performance on this number is just a very regular one, even for 1976 standard. But for me, this version is interesting although many will disagree on that. Then we go to 'I Got A Woman', nothing really worth of comment here except that this number start the Tucson part of this CD. The edit is very noticeable, as the sound picture is very different and Elvis voice is stronger in Tucson than in Odessa. Next is 'Love Me', performed as usual and then we go to 'If You "Love let me Go"' as Elvis names the Olivia Newton J. hit, and this is a regular version, sometimes a little weak, but mostly regular. 'Help Me' is the first alteration we have in the repertoire and is well performed. This version had the time slowed and sounds more peaceful than the early versions. It's a nice addition to the song lineup. 'Fever' is good. Elvis announces 'Polk Salad Annie' or "Sock a Little Tucson" and then we have the first real rocker of the night. This version holds no surprises, and by saying that I mean it's a good version. For me this late versions are more interesting than the early ones. After 'Polk Salad', something is edited out and if you listen close you'll notice that. My question is: What was cut out? On the Elvis tapes site, there's a song list for this show and I don't quite recall, but I think that 'One Night' and 'America The Beautiful' was on the list. If BMG edited these out it's a real shame! If they have to cut out something, why not cut for example 'All Shook Up', 'Jailhouse Rock' or 'Hound Dog', since this songs are in almost all shows and are just a scarf throw-away moment? I really hope that what was edited out is a very long dialogue with the audience. .
After introductions El goes to his recent record, 'Hurt' and does it twice. Both versions are good, but none have the high note ending. It's time to shake the house again with 'Burning Love' and that's a real surprise. It's a very good version with a long ending and Elvis do not mess up with the lyrics too much. A nice performance! The second "alteration" in the repertoire is 'Help Me Make It Thought The Night', and it's another good surprise. It's a tender, emotional version but a bit too short. "Hound" is next and well...its 'Hound Dog'. 'Funny How Times Slips Away' comes after 'Hound Dog' and it's below standard. Well, the end is near and Elvis greets the crowd, saying that they are really fantastic and reacted very well and then he goes to 'Can't Help Falling In Love'. The show is over and I don't think that the audience had gone to their homes disappointed. Overall I like to say that this is a good show, period. I think that many people have been disappointed because they wanted a fantastic show, since it was coming from the official label. But instead what we got is just a decent performance, sometimes better than average, with a good song lineup and a Elvis having a good time on stage with a good voice, although sometimes a little weak, and with a giant highlight that is 'Danny Boy'. For some strange reason I found this disc in my CD player more often than I thought it would be. I congratulate FTD for this release! What happened in 1976 that made Elvis stay on the road from March to December practically non stop? Things were slippin� out of hands for everybody, probably the only good solution at the time being, Tom Parker thought was to keep Elvis busy with the only thing he still could make him do the way he wanted, touring every absurd city of the States. And in a way or another, this is what he managed to get. The year started with the recordings for the new album, held in Graceland. After a short while Elvis started an incredible journey of concerts that ended on the 31st of December 1976. With few exceptions, a lot of average concerts were held, many were really bad, only a few very good ones. Often Elvis was in the arenas with his body, but not with his mind. Usually the track lists were the same, only the name of the cities would change. After being scattered from hotel rooms, airports, concerts and so on for three months, this is how Elvis sounded to the people that were paying good money to see him in concert on 30th of May in Odessa, Texas. Pretty bad I would say, 'See See Rider' gets a very, very tired interpretation! Luckily we then move to the concert of June 1, at the Community Center Arena in Tucson Arizona. Things were a little - but only a little - better. Almost every song got a fair rendition. In my opinion the only light that shine - but my God how it shine well - is 'Danny Boy'! It is rather astonishing how he managed to perform it so well without rehearsing it, but this Elvis; he did things in his life that only he could do. This is why we'll always be here talking about him. Even if overweight, ill, often mentally absent, HE WAS THE KING.